arning? You might find yourself going back and trying to get something that was like it and remain unhappy as you cannot find a substitute for it. Let’s take a walk down memory lane and find out the top ten cool foods discontinued we miss. You might actually remember some of them. 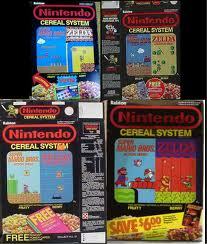 Ralston Cereals produced this Nintendo Breakfast Cereal System back in 1988. This cereal was very unique because the box was divided. Super Mario Bros was on one side. The Marios all had a fruity flavor with super mushrooms, Koopa Troopas, Goombas plus Bowsers. If you flip the box then you will see the Zelda Adventure Series which had links in them berry flavored, keys, shields, boomerangs and hearts. 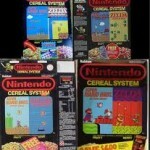 Inside the cereal box there was a treasure and you would find a sticker of the Nintendo character plus on the back you would have the Nintendo Power Cards. It has been discontinued from the stores but on online auction sites such as eBay you can buy the cereal for around $100-$130. Shark Bites happened to be a fruit snack that people of all ages loved. People would get the Shark Bites because they thought at first it was healthy just because of it having the word fruit on them but they were not healthy. The candy was gummy and had lots of sugar in it which is why it might have tasted so good. Betty Crocker produced Shark Bites. All the sharks had colors that represented some kind of fruit flavor such as red for cherry, yellow for strawberry, purple for grape, orange would be for orange, white is a mystery flavor and blue would be just blue. If you are a fan of Dr.Pepper then you might really miss this one. This gum tasted exactly like Dr.Pepper. The center of the gum was liquid and it just tasted really good. There’s lip gloss that taste like Dr.Pepper but you’re out of luck if you want Dr.Pepper gum. You will find that there are lots of other soda gum flavors available but might not be as good as this one was and back in the 80’s soda flavor gum was popular. Many people miss this energy drink and it’s still puzzling as to why the Coca-Cola Company stopped making it. The drink was very good and many people enjoyed it. You can still enjoy plenty of other energy drinks out there but you might not be satisfied enough if you liked this drink. There’s nothing like having a blast of energy from drinking coffee. over 300 calories so it was one Oreo that you didn’t want to eat every day. The Oreos were sold in individual packaging and they existed from around 1984 all the way up to 1991. There are lots of other Oreo variants but nothing beats this big Oreo. PB Max was indeed a real peanut butter snack. The cookie was crunchy and wholegrain. Mars launched the PB Max around 1989. It had made $50 million in sales but they still decided to discontinue the PB Max. The ingredients of the PB Max included sugar and hydrogenated vegetable oil. I guess these tasted good but did you even notice that they no longer make them? The good news is this is another one of those food items that you can buy online such as eBay or on Amazon for around $5/10 depending on the size bag that you order. I am surprised that Mr.PiBB was discontinued. It was the biggest competitor with Dr.Pepper. They have changed the Mr.PiBB formula and because of that reason it is now known as Pibb Xtra but it is not the same as Mr.PiBB. This drink was first known as Peppo but Dr.Pepper sued the Coke-Cola company for doing trademark infringement and then changed it to Mr.PiBB. The design of squeezit was very simple for children to use. All you needed to do was just take the top off and squeeze the drink. The drinks were very popular which was surprising because the flavors did not seem to be that great. General Mills made Squeezit from around the 1980’s until 2001. Some of the Squeezit flavors included Grumpy Grape, Rockin Red Puncher, Chucklin Cherry and Silly Billy Strawberry. Why, oh why did they discontinue Apple Newtons? There are many varieties of the Fig Newtons but good luck on finding the Apple Newtons. Do you remember in the 1961 film of the Parent Trap, Susan had a Fig Newton and offered it to her sister when they were both locked up in the cabin together? The other Newtons they are making might be good but not near as good as Apple Newton.